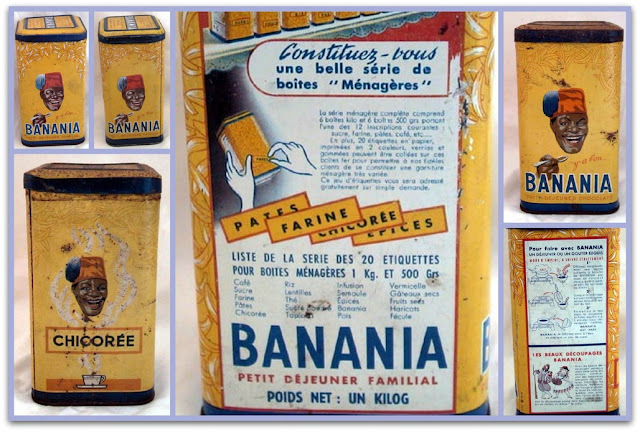 The response to my MM # 31 post on vintage French enamelware was wonderful, thank you, and I'm not at all surprised to find out that we're all chineurs one way or another. I really enjoyed reading about all the eclectic and diverse things that appeal to you. 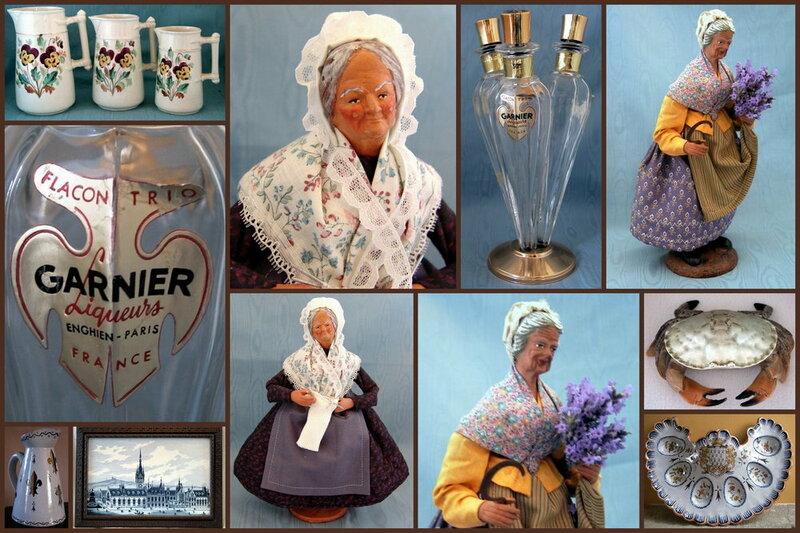 Whether it's ceramics, dolls, photographs, Beatrix Potter or Belleek china, tea cups or vintage linens, we do enjoy thrift/charity shops, garage sales, antique fairs and auctions. blue and white Delft ware, always a favourite. from Jo Ann (Scene Through My Eyes) "I think my collection of friends is the best one of all" and Sallie (Full Time Life) "one of my pleasures in blogging is "meeting" new people and seeing other ways to live the good life". For you, my lovely friends, my mosaics today are of some quirky and delightful treasures discovered whilst bargain hunting in Normandy and Brittany. vintage enamelware and a ceramic ashtray from a French brasserie. Don't laugh, I packed this collection of Banania tins away when we painted the dining room about seven years ago and haven't seen them since. I can't, for love nor money, remember where I put them. I found these crystal glass display pieces about 15 years ago, I think they're lovely but can never figure out the best way to use them. The only way to display flowers in them is to cut the stems very, very short and almost float the flower heads in the water. I love your Delft china pieces. 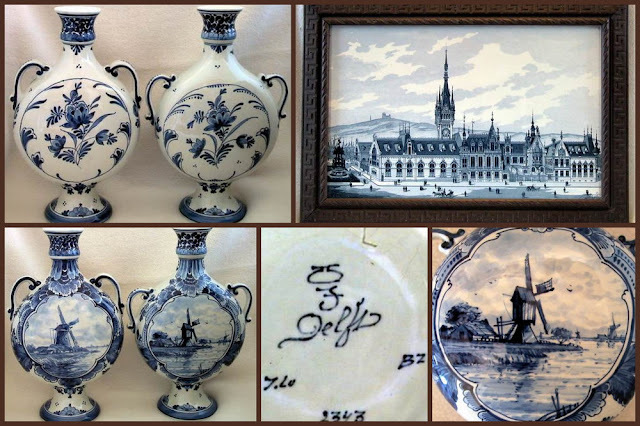 I realize that I have also collected some small Delft pieces over the years. I also have a collection of copper molds packed away that I never took out of their boxes after I moved. My new kitchen does not have the same display space that I used to have, but I can't part with them. I guess we are all collectors at heart! and thank you for hosting your so lovely link-up party and for posting such stunning images, I cannot believe my eyes, I'm so grateful to you for such a Beauty ! What does that breakfast beverage taste like? Don't you hate it when you can't find things? I almost turn the house upside down! Hello Maggie, lovely post! The old coffee mill is fascinating and brings back hidden memories. We had a hand grinder when the children were young. They used to argue over who would grind the coffee (the only job they actually volunteered to do) - visiting young friends would frequently ask to operate the grinder too.... Ready ground is so much easier but not necessarily better, and a lot less fun! The crystal flower display is lovely. As they are curved they could sit in front of another item, like a lamp or vase. One of these days when you are looking for something else that Bananua collection will turn up. At least you have a photo of it. I think it's hard to find someone who does not collect something, Maggie. We have about a dozen different collections going at any time and we are just about out of room in our house! The curved glass containers I have seen used as olive dishes. One for serving olives in and one for the pips! 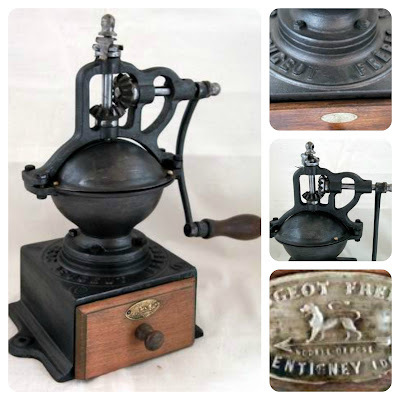 The coffee mill caught my eye because I have an antique coffee grinder mounted to the kitchen wall and use it every day. That Banania collection is interesting. I've never seen anything like it. Thank you for hosting, Maggie. I can see that I need to make more mosaics for next week. Let me come back and comment tomorrow; had a busy day, Night Night for tonight. We've just had our Autumnal Equinox in the Southern Hemisphere. Happy Autumn to all the Southerners (and Happy Spring to all the Northerners!). I have a collection of old china etc from my mother & mother-in-law which I cherish. I have no idea what that glass container is - but it looks pretty with your flowers. 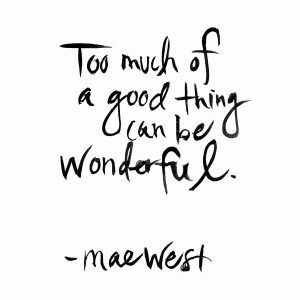 Have a fabulous week. The flower holders would be great for when your little kids or grands bring you a bouquet ... they always picked them with no stems )). You make such beautiful arrangements of all of your collectibles. Are the terra cotta santones the little old grandmother figures? I love those ... if only I collected... but this house already has all the (not so) little old ladies it has room for! I laughed about the 'lost' collection ... when we sold out to travel I found more than one collection that I'd temporarily stored at one time or another. Thanks so much for hosting and understanding what I meant when I commented last week! Another wonderful collection of mosaics of your collections, Maggie. I agree with Sallie and JoAnn that collecting friends is a great thing! The Delft is so pretty - I find it hard to resist anything blue and white. I had to laugh at your Banania story. It's so frustrating to know you have something but can't find it. It will likely turn up at the oddest moment. Thanks so much for hosting MM. Have a wonderful week. 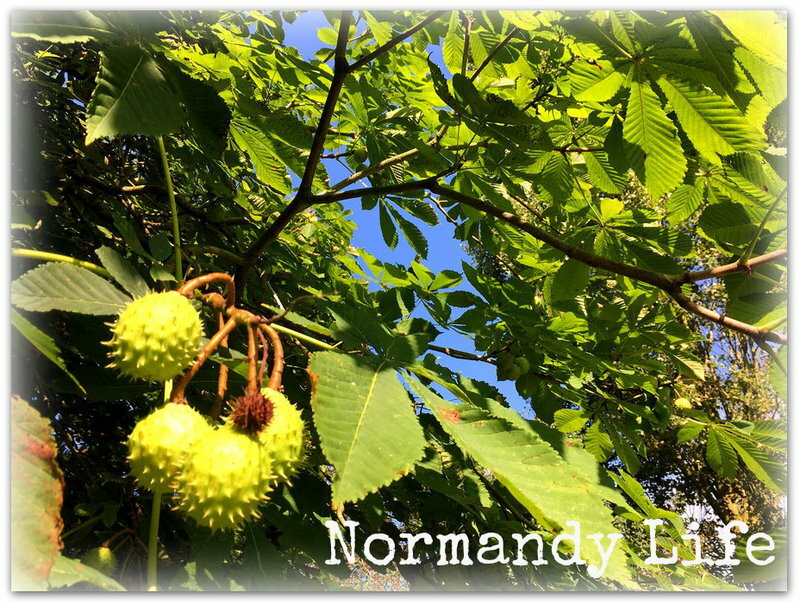 I think I should like to go treasure hunting in Normandy. 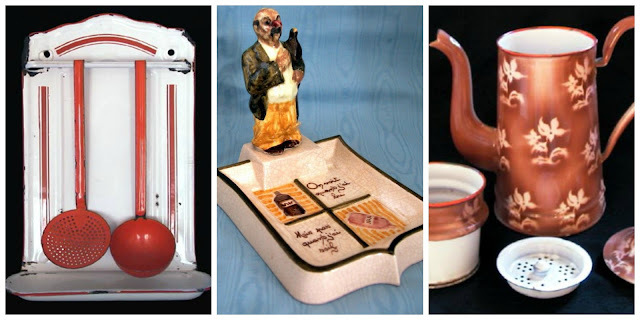 I especially like the Delft but your vintage pitchers are pretty charming too! Fun to display this way! Well, I'm late to the party, again, but never mind. Your collections are all charming! I particularly like your enamelware for its colour, since I can easily picture it in own kitchen, which is accented in red and white. Thanks for hosting! It's just after 1 am, Tuesday, and so I will return tomorrow, with a strong cup of coffee to visit everyone! What a charming post! I did not know what a santon was so I got Google to tell me. What a pleasure to see more of your collections, I appreciate the details/closeup views too. Thank you Maggie for Mosaic Monday 21, always appreciated. You show us real treasures in your mosaics. Your curvy crystal things are beautiful for flowers like that. Have a happy week! I love all your collections. I have collected similar treasures but now am trying and that is the operative word 'trying' to downsize----impossible! Beautiful mosaics - especially love the daisies - I'd never seen a piece like that. I'm with you on putting things away and wondering where they went. I have the cutest wire cupcake display piece - it isn't tiny and needs to be on a shelf by itself, as nothing stacks with it - and it has completely disappeared. I know my daughters didn't borrow it - I never took it someplace and accidentally left it there - but it is no where to be found. I figure if I buy another then it will pop right up and I'll be surprised as to where it actually way - and believe me, I've searched for it. And thanks for the nice comment on my comment. I just love this meme and glad you are keeping it going for us - I'd better get busy and make my collages - I'm late this week. There is always something special about delft pottery, it's appeal is so widespread. I often spot a piece of their pottery in my friend's home, it is so instantly recognisable and fits in so well in many homes!